1 F None No Power Seat 1 F is a standard Business Class Bulkhead seat. However, the proximity to the lavatory and galley may be bothersome. 1 J None No Power Seat 1 J is a standard Business Class Bulkhead seat. However, the proximity to the lavatory and galley may be bothersome. 1 K None No Power Seat 1 K is a standard Business Class Bulkhead seat. However, the proximity to the lavatory and galley may be bothersome. 10 A None No Power Seat 10 A is an Economy Class Bulkhead seat that may have limited legroom. The proximity to the galley and lavatory may be bothersome. The tray table is in the armrest, making the armrest immovable and slightly reducing seat width. There is no floor storage for this seat during takeoff and landing. 10 B None No Power Seat 10 B is an Economy Class Bulkhead seat that may have limited legroom. The proximity to the galley and lavatory may be bothersome. The tray table is in the armrest, making the armrest immovable and slightly reducing seat width. There is no floor storage for this seat during takeoff and landing. 10 C None No Power Seat 10 C is an Economy Class Bulkhead seat that may have limited legroom. The proximity to the galley and lavatory may be bothersome. The tray table is in the armrest, making the armrest immovable and slightly reducing seat width. There is no floor storage for this seat during takeoff and landing. 10 E None No Power Seat 10 E is an Economy Class Bulkhead seat that may have limited legroom. The proximity to the galley and lavatory may be bothersome. Also, this seat is a bassinet location and passengers traveling with infants may be seated in this area. The tray table is in the armrest, making the armrest immovable and slightly reducing seat width. There is no floor storage for this seat during takeoff and landing. 10 F None No Power Seat 10 F is an Economy Class Bulkhead seat that may have limited legroom. The proximity to the galley and lavatory may be bothersome. Also, this seat is a bassinet location and passengers traveling with infants may be seated in this area. The tray table is in the armrest, making the armrest immovable and slightly reducing seat width. There is no floor storage for this seat during takeoff and landing. 10 G None No Power Seat 10 G is an Economy Class Bulkhead seat that may have limited legroom. The proximity to the galley and lavatory may be bothersome. Also, this seat is a bassinet location and passengers traveling with infants may be seated in this area. The tray table is in the armrest, making the armrest immovable and slightly reducing seat width. There is no floor storage for this seat during takeoff and landing. 10 H None No Power Seat 10 H is an Economy Class Bulkhead seat that may have limited legroom. The proximity to the galley and lavatory may be bothersome. The tray table is in the armrest, making the armrest immovable and slightly reducing seat width. There is no floor storage for this seat during takeoff and landing. 10 J None No Power Seat 10 J is an Economy Class Bulkhead seat that may have limited legroom. The proximity to the galley and lavatory may be bothersome. The tray table is in the armrest, making the armrest immovable and slightly reducing seat width. There is no floor storage for this seat during takeoff and landing. 10 K None No Power Seat 10 K is an Economy Class Bulkhead seat that may have limited legroom. The proximity to the galley and lavatory may be bothersome. The tray table is in the armrest, making the armrest immovable and slightly reducing seat width. There is no floor storage for this seat during takeoff and landing. 11 E None No Power Seat 11 E is a standard Economy Class seat. All D seats may have limited legroom and storage space underneath the seat due to the presence of an entertainment equipment box under the seat in front. 12 D None No Power Seat 12 D is a standard Economy Class seat with extra legroom. All D seats may have limited storage space underneath the seat due to the presence of an entertainment equipment box under the seat in front. 17 A None No Power Seat 17 A is a standard Economy Class seat that is missing a window. All A seats may have limited legroom and storage space underneath the seat due to the presence of an entertainment equipment box under the seat in front. 17 K None No Power Seat 17 K is a standard Economy Class seat that is missing a window. All K seats may have limited legroom and storage space underneath the seat due to the presence of an entertainment equipment box under the seat in front. 23 C None No Power Seat 23 C is a standard Economy Class seat. However, this seat juts into aisle and may often be bumped by service carts or others passing by due to the awkward configuration transition from 3 to 2 seats. The proximity to the galley and lavatory may be bothersome. 23 H None No Power Seat 23 H is a standard Economy Class seat. However, this seat juts into aisle and may often be bumped by service carts or others passing by due to the awkward configuration transition from 3 to 2 seats. The proximity to the galley and lavatory may be bothersome. 24 A None No Power Seat 24 A is an Economy Class seat that may have limited recline due to the bulkhead behind. The proximity to the galley and lavatory may be bothersome. All A seats may have limited legroom and storage space underneath the seat due to the presence of an entertainment equipment box under the seat in front. 24 B None No Power Seat 24 B is an Economy Class seat that may have limited recline due to the bulkhead behind. The proximity to the galley and lavatory may be bothersome. 24 C None No Power Seat 24 C is an Economy Class seat that may have limited recline due to the bulkhead behind. The proximity to the galley and lavatory may be bothersome. 24 D None No Power Seat 24 D is an Economy Class seat that may have limited recline due to the bulkhead behind. The proximity to the galley and lavatory may be bothersome. All D seats may have limited legroom and storage space underneath the seat due to the presence of an entertainment equipment box under the seat in front. 24 E None No Power Seat 24 E is an Economy Class seat that may have limited recline due to the bulkhead behind. The proximity to the galley and lavatory may be bothersome. 24 F None No Power Seat 24 F is an Economy Class seat that may have limited recline due to the bulkhead behind. The proximity to the galley and lavatory may be bothersome. 24 G None No Power Seat 24 G is an Economy Class seat that may have limited recline due to the bulkhead behind. The proximity to the galley and lavatory may be bothersome. 24 H None No Power Seat 24 H is an Economy Class seat that may have limited recline due to the bulkhead behind. The proximity to the galley and lavatory may be bothersome. 24 J None No Power Seat 24 J is an Economy Class seat that may have limited recline due to the bulkhead behind. The proximity to the galley and lavatory may be bothersome. 24 K None No Power Seat 24 K is an Economy Class seat that may have limited recline due to the bulkhead behind. The proximity to the galley and lavatory may be bothersome. All K seats may have limited legroom and storage space underneath the seat due to the presence of an entertainment equipment box under the seat in front. 25 A None No Power Seat 25 A is an Economy Class Exit Row seat that may have extra legroom. The proximity to the galley and lavatory may be bothersome. The tray table is in the armrest, making the armrest immovable and slightly reducing seat width. There is no floor storage for this seat during takeoff and landing. 25 B None No Power Seat 25 B is an Economy Class Exit Row seat that may have extra legroom. The proximity to the galley and lavatory may be bothersome. The tray table is in the armrest, making the armrest immovable and slightly reducing seat width. There is no floor storage for this seat during takeoff and landing. 25 C None No Power Seat 25 C is an Economy Class Exit Row seat that may have extra legroom. The proximity to the galley and lavatory may be bothersome. The tray table is in the armrest, making the armrest immovable and slightly reducing seat width. There is no floor storage for this seat during takeoff and landing. 25 E None No Power Seat 25 E is an Economy Class Bulkhead seat that may have extra legroom. The proximity to the galley and lavatory may be bothersome. Also, this seat is a bassinet location and passengers traveling with infants may be seated in this area. The tray table is in the armrest, making the armrest immovable and slightly reducing seat width. There is no floor storage for this seat during takeoff and landing. 25 F None No Power Seat 25 F is an Economy Class Bulkhead seat that may have extra legroom. The proximity to the galley and lavatory may be bothersome. Also, this seat is a bassinet location and passengers traveling with infants may be seated in this area. The tray table is in the armrest, making the armrest immovable and slightly reducing seat width. There is no floor storage for this seat during takeoff and landing. 25 G None No Power Seat 25 G is an Economy Class Bulkhead seat that may have extra legroom. The proximity to the galley and lavatory may be bothersome. Also, this seat is a bassinet location and passengers traveling with infants may be seated in this area. The tray table is in the armrest, making the armrest immovable and slightly reducing seat width. There is no floor storage for this seat during takeoff and landing. 25 H None No Power Seat 25 H is an Economy Class Exit Row seat that may have extra legroom. The proximity to the galley and lavatory may be bothersome. The tray table is in the armrest, making the armrest immovable and slightly reducing seat width. There is no floor storage for this seat during takeoff and landing. 25 J None No Power Seat 25 J is an Economy Class Exit Row seat that may have extra legroom. The proximity to the galley and lavatory may be bothersome. The tray table is in the armrest, making the armrest immovable and slightly reducing seat width. There is no floor storage for this seat during takeoff and landing. 25 K None No Power Seat 25 K is an Economy Class Exit Row seat that may have extra legroom. The proximity to the galley and lavatory may be bothersome. The tray table is in the armrest, making the armrest immovable and slightly reducing seat width. There is no floor storage for this seat during takeoff and landing. 26 E None No Power Seat 26 E is a standard Economy Class seat. All D seats may have limited legroom and storage space underneath the seat due to the presence of an entertainment equipment box under the seat in front. 27 D None No Power Seat 27 D is a standard Economy Class seat with extra legroom. All D seats may have limited storage space underneath the seat due to the presence of an entertainment equipment box under the seat in front. 36 A None No Power Seat 36 A is an Economy Class seat that may have limited recline due to the bulkhead behind. The proximity to the galley and lavatory may be bothersome. All A seats may have limited legroom and storage space underneath the seat due to the presence of an entertainment equipment box under the seat in front. 36 B None No Power Seat 36 B is an Economy Class seat that may have limited recline due to the bulkhead behind. The proximity to the galley and lavatory may be bothersome. 36 C None No Power Seat 36 C is an Economy Class seat that may have limited recline due to the bulkhead behind. The proximity to the galley and lavatory may be bothersome. 36 D None No Power Seat 36 D is an Economy Class seat that may have limited recline due to the bulkhead behind. The proximity to the galley and lavatory may be bothersome. All D seats may have limited legroom and storage space underneath the seat due to the presence of an entertainment equipment box under the seat in front. 36 E None No Power Seat 36 E is an Economy Class seat that may have limited recline due to the bulkhead behind. The proximity to the galley and lavatory may be bothersome. 36 F None No Power Seat 36 F is an Economy Class seat that may have limited recline due to the bulkhead behind. The proximity to the galley and lavatory may be bothersome. 36 G None No Power Seat 36 G is an Economy Class seat that may have limited recline due to the bulkhead behind. The proximity to the galley and lavatory may be bothersome. 36 H None No Power Seat 36 H is an Economy Class seat that may have limited recline due to the bulkhead behind. The proximity to the galley and lavatory may be bothersome. 36 J None No Power Seat 36 J is an Economy Class seat that may have limited recline due to the bulkhead behind. The proximity to the galley and lavatory may be bothersome. 36 K None No Power Seat 36 K is an Economy Class seat that may have limited recline due to the bulkhead behind. The proximity to the galley and lavatory may be bothersome. All K seats may have limited legroom and storage space underneath the seat due to the presence of an entertainment equipment box under the seat in front. 37 A None No Power Seat 37 A is an Economy Class Exit Row seat that may have extra legroom. The proximity to the galley and lavatory may be bothersome. The tray table is in the armrest, making the armrest immovable and slightly reducing seat width. There is no floor storage for this seat during takeoff and landing. 37 B None No Power Seat 37 B is an Economy Class Exit Row seat that may have extra legroom. The proximity to the galley and lavatory may be bothersome. The tray table is in the armrest, making the armrest immovable and slightly reducing seat width. There is no floor storage for this seat during takeoff and landing. 37 C None No Power Seat 37 C is an Economy Class Exit Row seat that may have extra legroom. The proximity to the galley and lavatory may be bothersome. The tray table is in the armrest, making the armrest immovable and slightly reducing seat width. There is no floor storage for this seat during takeoff and landing. 37 D None No Power Seat 37 D is an Economy Class Bulkhead seat that may have extra legroom. The proximity to the galley and lavatory may be bothersome. Also, this seat is a bassinet location and passengers traveling with infants may be seated in this area. The tray table is in the armrest, making the armrest immovable and slightly reducing seat width. There is no floor storage for this seat during takeoff and landing. 37 E None No Power Seat 37 E is an Economy Class Bulkhead seat that may have extra legroom. The proximity to the galley and lavatory may be bothersome. Also, this seat is a bassinet location and passengers traveling with infants may be seated in this area. The tray table is in the armrest, making the armrest immovable and slightly reducing seat width. There is no floor storage for this seat during takeoff and landing. 37 G None No Power Seat 37 G is an Economy Class Bulkhead seat that may have extra legroom. The proximity to the galley and lavatory may be bothersome. Also, this seat is a bassinet location and passengers traveling with infants may be seated in this area. The tray table is in the armrest, making the armrest immovable and slightly reducing seat width. There is no floor storage for this seat during takeoff and landing. 37 H None No Power Seat 37 H is an Economy Class Exit Row seat that may have extra legroom. The proximity to the galley and lavatory may be bothersome. The tray table is in the armrest, making the armrest immovable and slightly reducing seat width. There is no floor storage for this seat during takeoff and landing. 37 J None No Power Seat 37 J is an Economy Class Exit Row seat that may have extra legroom. The proximity to the galley and lavatory may be bothersome. The tray table is in the armrest, making the armrest immovable and slightly reducing seat width. There is no floor storage for this seat during takeoff and landing. 37 K None No Power Seat 37 K is an Economy Class Exit Row seat that may have extra legroom. The proximity to the galley and lavatory may be bothersome. The tray table is in the armrest, making the armrest immovable and slightly reducing seat width. There is no floor storage for this seat during takeoff and landing. 38 A None No Power Seat 38 A is a standard Economy Class seat. All A seats may have limited legroom and storage space underneath the seat due to the presence of an entertainment equipment box under the seat in front. 38 E None No Power Seat 38 E is a standard Economy Class seat. All D seats may have limited legroom and storage space underneath the seat due to the presence of an entertainment equipment box under the seat in front. 38 K None No Power Seat 38 K is a standard Economy Class seat. All K seats may have limited legroom and storage space underneath the seat due to the presence of an entertainment equipment box under the seat in front. 39 A None No Power Seat 39 A is a standard Economy Class seat. All A seats may have limited legroom and storage space underneath the seat due to the presence of an entertainment equipment box under the seat in front. 39 K None No Power Seat 39 K is a standard Economy Class seat. All K seats may have limited legroom and storage space underneath the seat due to the presence of an entertainment equipment box under the seat in front. 4 B None No Power Seat 4 B is a Business Class seat. However, the proximity to the galley may be bothersome. 4 E None No Power Seat 4 E is a Business Class seat. However, the proximity to the galley may be bothersome. 4 F None No Power Seat 4 F is a Business Class seat. However, the proximity to the galley may be bothersome. 4 J None No Power Seat 4 J is a Business Class seat. However, the proximity to the galley may be bothersome. 40 A None No Power Seat 40 A is a standard Economy Class seat. All A seats may have limited legroom and storage space underneath the seat due to the presence of an entertainment equipment box under the seat in front. 40 K None No Power Seat 40 K is a standard Economy Class seat. All K seats may have limited legroom and storage space underneath the seat due to the presence of an entertainment equipment box under the seat in front. 41 A None No Power Seat 41 A is a standard Economy Class seat. All A seats may have limited legroom and storage space underneath the seat due to the presence of an entertainment equipment box under the seat in front. 41 D None No Power Seat 41 D is a standard Economy Class seat. All D seats may have limited legroom and storage space underneath the seat due to the presence of an entertainment equipment box under the seat in front. 41 K None No Power Seat 41 K is a standard Economy Class seat. All K seats may have limited legroom and storage space underneath the seat due to the presence of an entertainment equipment box under the seat in front. 42 A None No Power Seat 42 A is a standard Economy Class seat. All A seats may have limited legroom and storage space underneath the seat due to the presence of an entertainment equipment box under the seat in front. 42 D None No Power Seat 42 D is a standard Economy Class seat. All D seats may have limited legroom and storage space underneath the seat due to the presence of an entertainment equipment box under the seat in front. 42 K None No Power Seat 42 K is a standard Economy Class seat. All K seats may have limited legroom and storage space underneath the seat due to the presence of an entertainment equipment box under the seat in front. 43 A None No Power Seat 43 A is a standard Economy Class seat. All A seats may have limited legroom and storage space underneath the seat due to the presence of an entertainment equipment box under the seat in front. 43 D None No Power Seat 43 D is a standard Economy Class seat. All D seats may have limited legroom and storage space underneath the seat due to the presence of an entertainment equipment box under the seat in front. 43 K None No Power Seat 43 K is a standard Economy Class seat. All K seats may have limited legroom and storage space underneath the seat due to the presence of an entertainment equipment box under the seat in front. 44 A None No Power Seat 44 A is a standard Economy Class seat. All A seats may have limited legroom and storage space underneath the seat due to the presence of an entertainment equipment box under the seat in front. 44 D None No Power Seat 44 D is a standard Economy Class seat. All D seats may have limited legroom and storage space underneath the seat due to the presence of an entertainment equipment box under the seat in front. 44 K None No Power Seat 44 K is a standard Economy Class seat. All K seats may have limited legroom and storage space underneath the seat due to the presence of an entertainment equipment box under the seat in front. 45 A None No Power Seat 45 A is a standard Economy Class seat. All A seats may have limited legroom and storage space underneath the seat due to the presence of an entertainment equipment box under the seat in front. 45 D None No Power Seat 45 D is a standard Economy Class seat. All D seats may have limited legroom and storage space underneath the seat due to the presence of an entertainment equipment box under the seat in front. 45 K None No Power Seat 45 K is a standard Economy Class seat. All K seats may have limited legroom and storage space underneath the seat due to the presence of an entertainment equipment box under the seat in front. 46 A None No Power Seat 46 A is a standard Economy Class seat. All A seats may have limited legroom and storage space underneath the seat due to the presence of an entertainment equipment box under the seat in front. 46 D None No Power Seat 46 D is a standard Economy Class seat. All D seats may have limited legroom and storage space underneath the seat due to the presence of an entertainment equipment box under the seat in front. 46 K None No Power Seat 46 K is a standard Economy Class seat. All K seats may have limited legroom and storage space underneath the seat due to the presence of an entertainment equipment box under the seat in front. 47 A None No Power Seat 47 A is a standard Economy Class seat. All A seats may have limited legroom and storage space underneath the seat due to the presence of an entertainment equipment box under the seat in front. 47 E None No Power Seat 47 E is a standard Economy Class seat. All D seats may have limited legroom and storage space underneath the seat due to the presence of an entertainment equipment box under the seat in front. 47 K None No Power Seat 47 K is a standard Economy Class seat. All K seats may have limited legroom and storage space underneath the seat due to the presence of an entertainment equipment box under the seat in front. 48 A None No Power Seat 48 A is a standard Economy Class seat. All A seats may have limited legroom and storage space underneath the seat due to the presence of an entertainment equipment box under the seat in front. 48 E None No Power Seat 48 E is a standard Economy Class seat. All D seats may have limited legroom and storage space underneath the seat due to the presence of an entertainment equipment box under the seat in front. 48 K None No Power Seat 48 K is a standard Economy Class seat. All K seats may have limited legroom and storage space underneath the seat due to the presence of an entertainment equipment box under the seat in front. 49 A None No Power Seat 49 A is a standard Economy Class seat. All A seats may have limited legroom and storage space underneath the seat due to the presence of an entertainment equipment box under the seat in front. 49 C None No Power Seat 49 C is a standard Economy Class seat. However, this seat juts into aisle and may often be bumped by service carts or others passing by due to the awkward configuration transition from 3 to 2 seats. The proximity to the galley and lavatory may be bothersome. 49 E None No Power Seat 49 E is a standard Economy Class seat. All D seats may have limited legroom and storage space underneath the seat due to the presence of an entertainment equipment box under the seat in front. 49 H None No Power Seat 49 H is a standard Economy Class seat. However, this seat juts into aisle and may often be bumped by service carts or others passing by due to the awkward configuration transition from 3 to 2 seats. The proximity to the galley and lavatory may be bothersome. 49 K None No Power Seat 49 K is a standard Economy Class seat. All K seats may have limited legroom and storage space underneath the seat due to the presence of an entertainment equipment box under the seat in front. 50 A None No Power Seat 50 A is an Economy Class seat located in the last row of the plane and may have limited recline. The proximity to the lavatory and galley may be bothersome. All A seats may have limited legroom and storage space underneath the seat due to the presence of an entertainment equipment box under the seat in front. 50 B None No Power Seat 50 B is an Economy Class seat located in the last row of the plane and may have limited recline. The proximity to the lavatory and galley may be bothersome. 50 E None No Power Seat 50 E is an Economy Class seat located in the last row of the plane and may have limited recline. The proximity to the lavatory and galley may be bothersome. All D seats may have limited legroom and storage space underneath the seat due to the presence of an entertainment equipment box under the seat in front. 50 F None No Power Seat 50 F is an Economy Class seat located in the last row of the plane and may have limited recline. The proximity to the lavatory and galley may be bothersome. 50 G None No Power Seat 50 G is an Economy Class seat located in the last row of the plane and may have limited recline. The proximity to the lavatory and galley may be bothersome. 50 J None No Power Seat 50 J is an Economy Class seat located in the last row of the plane and may have limited recline. The proximity to the lavatory and galley may be bothersome. 50 K None No Power Seat 50 K is an Economy Class seat located in the last row of the plane and may have limited recline. The proximity to the lavatory and galley may be bothersome. All K seats may have limited legroom and storage space underneath the seat due to the presence of an entertainment equipment box under the seat in front. Qatar Airways is operating the Boeing 777-300ER on a variety of long-haul destinations. There are three versions of the B777-300ER, both with only two classes of service where all Business Class seats feature 180 degree recline. For this Version, Business Class is found from rows 1 to 4 and Economy Class begins at row 10, ending at row 50. This aircraft flies with 24 seats of Business Class and 388 seats of Economy Class. 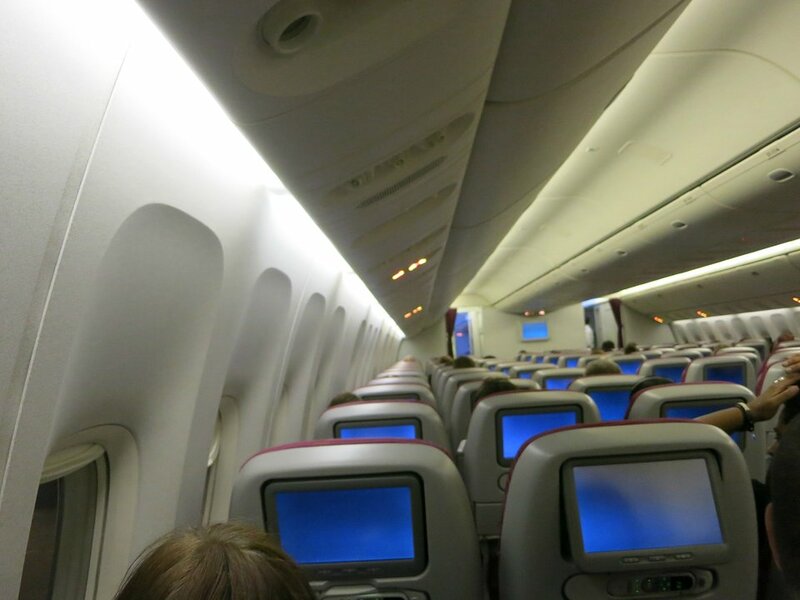 In the Economy Class, all A, D, and K seats may have limited legroom and storage space underneath the seat due to the presence of an entertainment equipment box under the seat in front. The armrests in Economy Class do not rise entirely. Sorry Qatar this setup of 3 4 3 is to small,your service is top class ,but for over sixhours with somebody who put their seat in your lap for the whole flight is no fun!On my return flight from Amsterdam i was lucky and had nobody next to me ,and the person in front left the seat upright, your service and staff are great,good meals plenty of drinks.Thank you. Lots of leg room because of the missing seat in front, but the seat is even more narrow than the already narrow seats on this aircraft due to the monitor and table being in fixed armrest. Also, no seat pocket or under seat storage. Constantly being stepped upon with the open leg room area. Would not recommend. Best thing about this seat is you don´t have a seat in front of view and enough space to stretch the legs. But then it´s over with the positive things because with no seat in front you don´t have a pocket or something to store your belongings. 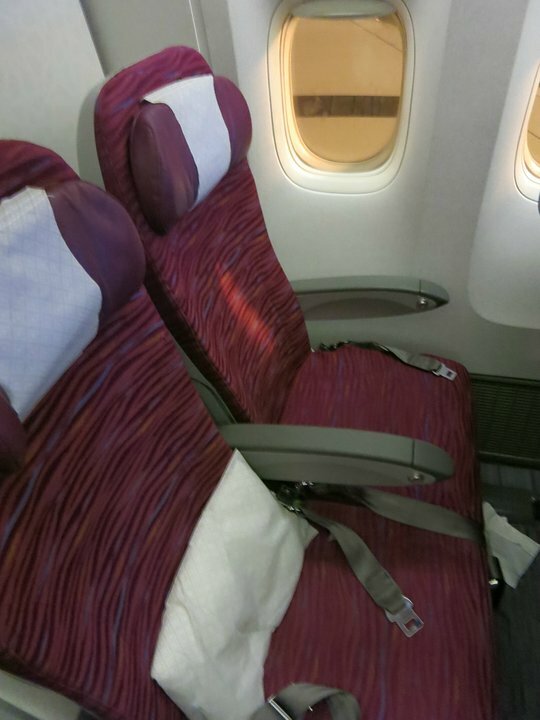 But the worst thing about all seats in Qatar´s 3-4-3 Boeing 777 is the width of the seat. Never ever felt on any flight so close to the guy next to me like on this flight. Both of us were neither athletic or strong but we were touching shoulder to shoulder all the time. Can´t imagine going on Qatar Air on a North America flight for 15 hours. Considering Qatar is the airline of the year 2017 this economy class seat comfort is just pure disappointment. This is the worst long haul flight I have ever flown to or from Perth. The seats are so narrow even for slim people. I sat by the window which usually has more space because of the plane curvature. This plane and seat did not. The armrest was right up against the body of the plane. Leg room was okay but width was atrocious. Leaving Doha it took the staff 2hrs before serving food and then another hour to collect the food containers. When you leave at 2am and it takes them until 5am to clear away when the sun is just coming up it doesn't allow for sleep. Also window shades were not closed by a number of people making the plane light and impossible to sleep. As we had caught a connecting flight from Manchester that meant 20 hours without sleep. 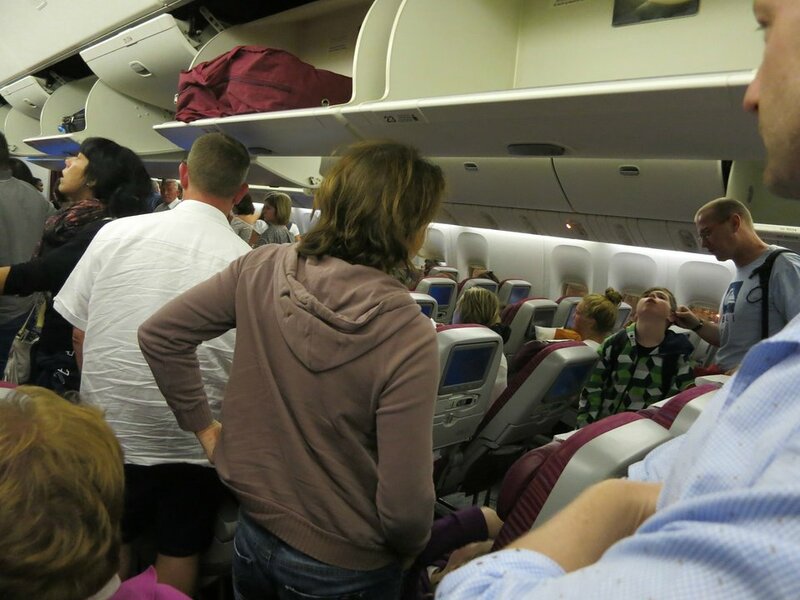 I won't fly Qatar long haul out of Perth ever again. Good leg room, good space under the seat in front of you. The seat was quite hard with little cushioning. The supplied pillow helped a little bit but not on the bottom. Food and service was great, but this plane looks and feels a little dated. Although it says that there is an entertainment box underneath the seat, I did not see one present. Seats feel a little cramped in 3-4-3 configuration. Kept bumping elbows and shoulders into the person in 29B despite us both being fairly thin and small people. Flew this V2 layout twice in past week, so I'm sharing updates. Current SeatGuru advice on AV equipment boxes under seats is incorrect -- the AV boxes are now under seats B, G, J, but don't stress about it, because these new boxes are very slim and don't take up much space. F&B service was inconsistent: on first flight mid-afternoon, they pushed a full beverage cart to offer drinks with the meal. On return flight, early evening, they handed out tiny packs of juice, no beverage cart with other options. If you want wine, ask for it --- this airline doesn't seem to offer it, but has it available in the carts! Horrible. This was a DOH to MNL flight. Totally packed in like sardines. Many Filipinos returning from overseas work. I suppose Qatar does not feel the need to provide decent seating. The 3-4-3 seating is narrow. The legroom is OK. Just inhuman cattle-car seating. Next tome we will pay more to get an airline which offers better seating. 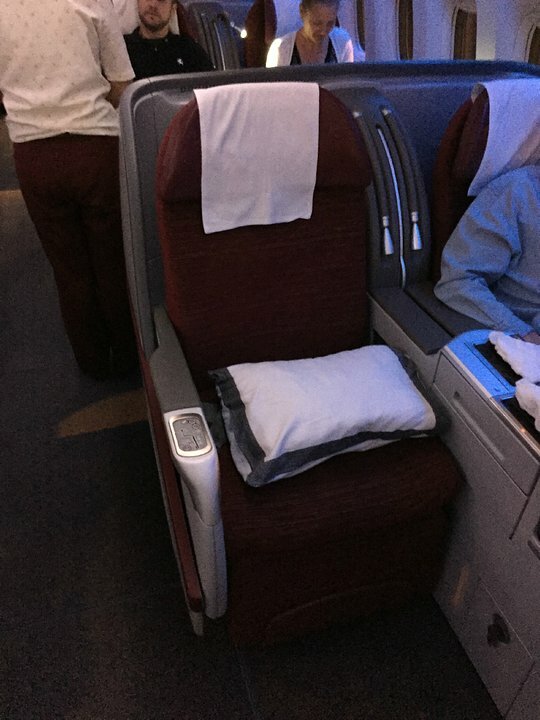 Flew Qatar from Doha to Bangkok on April 1st in a newer 777 wide body. My seat was 15C which is an aisle on a side that is next to the windows. Economy seating was 3-4-3. Plenty of leg room, the seat reclined but not a whole lot. I found it hard to get comfortable, but I am a wiggly person. They provided a nice pillow, blanket, no amenity kit. 2 meals were served, dinner and breakfast for a 6 hour flight. Food was just o.k. The video monitor was in the seat back in front of me and was a nice size. The remote was located under it, and a USB charging port to the side. This was a fairly new plane and overall pretty comfortable. It has a large passenger capacity but I didn't notice any issues. Row 10 which is marked yellow has a TON of leg room, as well as Row 26. Exit row, next to doors. There is a LOT of overhead storage. They did board using a separate entrance and exit for business passengers. Lie Flat beds, It is a smaller cabin. Having travelled outbound on the A380, the impression given by the 773 is very poor. Horribly cramped with the 3-4-3 layout. 10 abreast is simply too many for this aircraft. Unable to pass along the narrow aisle, and virtually no elbow room when sitting. Legroom is average . If you have any sort of choice avoid the QR 777 in this layout. Accidental choice; assumed we'd be on 777-V1 (as outbound flt). The 10 across config ensured the fat Guy next to me couldn't help but spill into my seat. We were really crushed for width. I had to climb onto the armrest & jump over him into the aisle to go to the WC. Easier than waking him & asking him to squeeze out. Scared the cr*p out of him when I had to climb back over him. Poor fella. We played elbows a bit, but I found it easier just to rest my arm on his. Loadsa legroom though. Person in front only reclined part-way. Seat was well designed & comfortable for sleep. Slept like a baby the rest of the flight, even through b'fast. ife was sound. Will avoid this config in future though or ensure an aisle seat, as I do not like to be crushed. Very bad seat. The seat width is like all other economy class seats on the 777 poor and feels very cramped, even for a pretty athletic person like I am. In addition this seat is close to the lavatories which makes it very noisy. But the worst thing was, that almost everybody passing by pumped into me due to exposed position of the seat, which made sleeping impossible. Excellent service and excellent seats. The pitch is the best one I've had on a B777, super spacious both between seats and the width of it. Beware that the food service (at least in my case) will start from rows 10 to 18 and then from rows 19 to 24, so if you seat on the row 18 you'll get whats left and possibly cold. First time flying with Qatar and I have to say it is incredible! The food and the staff was excellent! Very good legroom if your legs can fit. The IFE is a little outdated but I was still satisfied. The only problem is the row 17 is missing a window. I highly recommend it. 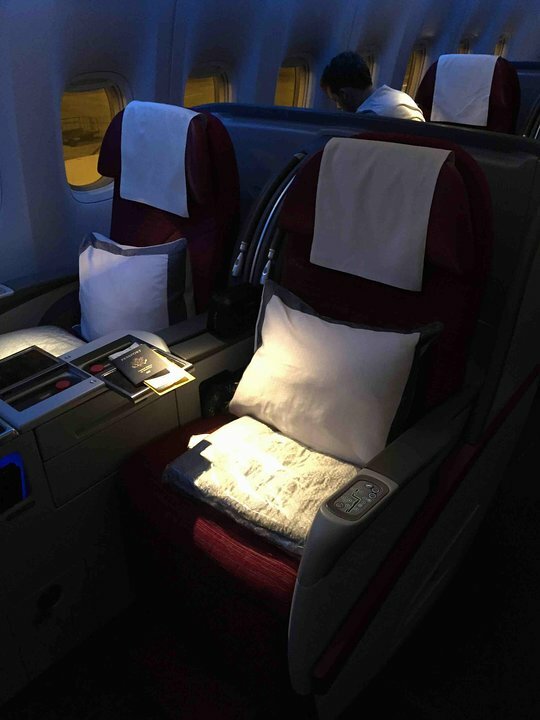 I suggest if you do fly with Qatar that you book online and choose your seat, meal preference (There is about 20) and it makes the flight more enjoyable. Qatar Airways flies 4 versions of Boeing 777-300ER (77W) V1.